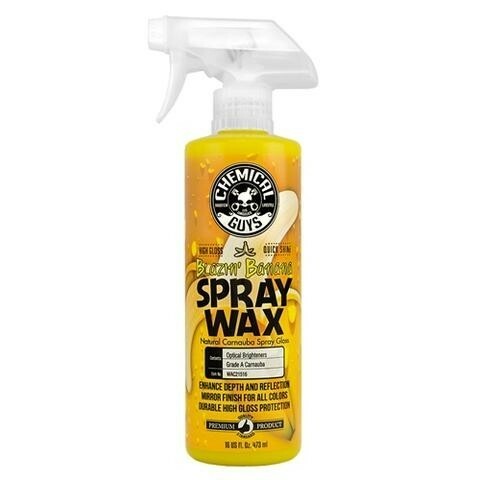 Chemical Guys Blazin' Banana Spray Wax will change the way you wax your car forever! Blazin’ Banana brings the shine in half the time. Give your vehicle the brilliant shine, reflection and feel of a just-waxed carnauba finish, just spray and wipe. It’s bananas - a liquid car wax you simply spray on. Spray it on anytime for a fast shine or use right after you wash, while the surface is wet, as you dry for a popping brilliant shine. Chemical Guys Blazin’ Banana Spray Wax gives you the control to keep your car looking amazing with a deep, glossy shine anywhere you may be. While traditional paste and cream waxes are time-consuming to apply, the application process of Blazin’ Banana Spray Wax merely takes a few seconds with every spray. Now, everywhere you go, your car rules the streets as contamination slips off of the paint with the power of Chemical Guys Blazin’ Banana Spray Wax.